From the pages of Dark Horse Presents! Art– Robert Love brings to life this interesting introductory tale which shines in action and emotional scenes. The colors by Diego Simone and Michelle Davies also add a dynamism thank to lighting and contrast that truly brings the entire package together in a beautiful way. Story– This tale published by Dark Horse Comics takes place in another dystopic future. This one is the result of a scientist who created a virus which mutated the homosapien race into mutant creatures. An amnesiac black boy wanders the desert alone. He runs into an Ogre feeding on a little girl with three eyes. His arms morph into ballistic weapons and he kills the Ogre and rescues the little girl. After he makes her a prosthetic leg they meet upon her father who takes the boy with them. At the girls home the father quickly subdues the boy. Elsewhere his “siblings” learn of his location. The father reveals to the boy that he was created to kill all mutants and being a mutant himself he refuses to go peacefully into the night. 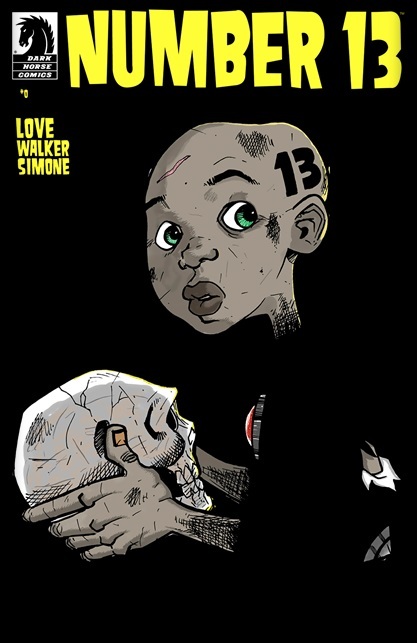 Black Hero- Number thirteen is an interesting addition to the black superhero ranks. Not much of a personality yet but since this is a 0 issue things must develop from here. I like his origin and the mystery of why he had amnesia in the first place and how he fits into his siblings plans. What other nefarious schemes did his father set in motion before his death? Is his father actually dead? New World– Dystopic futures are a staple/cliché of most science fiction based tales at this point. I’m entertained enough to see where this one goes especially with a mutated human race and cyborg based “purifiers” all around. Character- For a first issue this one really did not allow for any true connection between the reader and the titular character. Cliché- It’s yet another tale of dystopia. I got this series a while ago. I need to review myself soon.